Madrid (Agenzia Fides) - "Nothing is lost in the hands of the Lord. The missionary disciple puts himself in the hands of the Lord. Blessed Don Anastasio, died believing what the Lord said": said Cardinal Carlos Osoro, Archbishop of Madrid, who yesterday in the Cathedral of Almudena in Madrid presided a church service in memory of Fr. Anastasio Gil, National Director of the Pontifical Mission Societies (PMS), who died on 7 September after a long illness (see Fides 07/09/2018). Card. 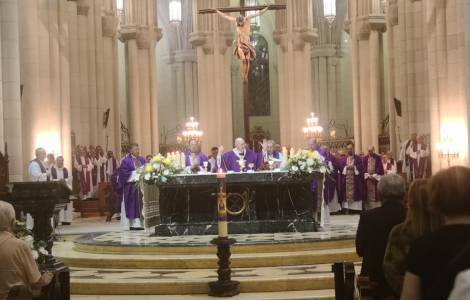 Osoro concelebrated Mass together with the Auxiliary Bishop of Madrid, Juan Antonio Martínez Camino, Military Ordinary, Archbishop Juan del Río, and the Archbishop of Pamplona, Francisco Pérez, former National Director of the PMS, together with dozens of priests of Madrid and other dioceses, as well as missionaries.